HALL CAPACITY: 100 for dining, 129 if the stage is used for dining as well. FULL KITCHEN: convection oven, dbl oven range and 6 top burners, 3-compartment sink, vegetable rinsing sink, hand washing sink, small fridge for event use, stainless steel work table. We have an array of kitchen cooking utensils, but recommend bring your own cookware when possible. Mismatched plates, bowls, cups & utensils available. FIRE PLACE: usage must be approved by Manager and clean-up scheduled 72 hours after use. MIRRORS: four 5′ wide Mylar surface mirrors – must be moved carefully from the sides to not damage the Mylar surface. PROJECTOR INFO: Screen for movies available for no charge and a projector ($35 projector fee) Renter must test out equipment 24 hour prior to using it to make sure all technology links correctly! 12 mics. 5 – DI boxes, etc. Pt. Reyes Light, for advertising space and/or Local Calendar (free) tel: (415) 663-8404 fax: (415) 663-8458 email: editor@ptreyeslight.com, web: www.ptreyeslight.com. The Bolinas Community Center’s general policy focuses on keeping the center open for public use. However we do rent the hall and kitchen for private events and wedding receptions. Due to the limited parking in downtown Bolinas we recommend having a shuttle that brings guests to and from the Community Center to Mesa Park, for example. You must attain permission from the Mesa Park board to use the parking lot, which meets every second Monday of the month at the Bolinas Fire House at 7pm. Private rentals are $1700 from 2pm-midnight. An extra $100 is charged if the space is needed for the day before for set-up and another $100 for the day after for breakdown. Kitchen rental is $12/hour for events. We ask for half of the full payment to hold the date which is fully refundable up to 30 days prior to the event. After 30 days the down payment is forfeited if the event is cancelled. A separate $200 check is needed as a security/cleaning deposit which will be returned if all contractual agreements are met. Please let us know if you are interested in looking at available dates and possibly having a walk-thru of our facility. A sound systems set-up technician and /or engineer must be hired to use the Bolinas Community Center’s sound system. The system may not be set up or used by unauthorized individuals. The theatre lighting system must be run by an authorized, trained technician and returned to the original configuration it was found in. The gallery lighting system must be set up by a trained technician and returned to the original configuration it was found in. Fees are to insure the systems remain in good working order. It is renter’s responsibility to hire & pay technicians, pls ask Manager for contacts. Renter will be responsible for publicity, programs, door personnel, security guards, ushers, etc. 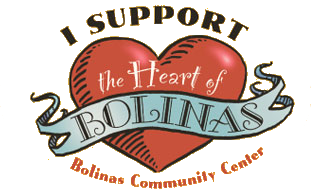 If given 30 days’ notice prior to the event The Bolinas Community Center will post the event info in the Bolinas Hearsay News, the BCC website, monthly newsletter and printed calendars at the Center. It is advised the renter submits articles and advertisements for their event in the papers and posts fliers of their event around town. Internet advertising is OK.
Renter agrees to adhere to all fire safety regulations regarding exits, lighting, parking and open flame. All Exit doors must be left accessible and stairways empty. Renter agrees to provide supervision for the event sufficient to ensure protection of Center facilities. Events attracting children must have a security person stationed at the foyer doors to stop kids from running into the street! Renter assumes all liability for injury to those attending or performing during the above event. There is NO SMOKING in the building. Children are not allowed to play on the stage, stairs or racks that hold chairs and tables. Children are not allowed to touch the mirrors as the Mylar surface can be easily damaged. Sound in the Center must never exceed 95 decibels for safety reasons. If decibels are more than 95 the security deposit will be forfeited and a warning will be given to the renter. Events which are expected to draw an audience mostly of those under 21 years of age will not be allowed to serve alcohol. If a renter would like the presence of an alcohol bar at their event it is to profit the Bolinas Community Center. A liquor permit is required for any event where beer or wine will be sold and the Community Center needs 30 day notice in advance to attain the liquor license. Only non-profits may acquire their own liquor licenses. In the case where alcohol will be served all entrants shall be asked to provide age identification upon entrance. No alcohol will be served to those under 21 or for those already under the influence; who have had “too much” to drink. IDs must be checked! There is no smoking of any kind permitted inside the hall, foyer or bathrooms or 20 feet from the doors. The use of illegal drugs is not permitted on Bolinas Community Center property. As part of the Bolinas Community Centers’ efforts to reduce, reuse, recycle, we are now requiring all events to use greener products when disposables are to be used. We supply paper plates and bowls, wooden cutlery, hot and cold beverage cups. All napkins are 100% recycled paper. These items are all in stock and will be supplied to the renter with two weeks advance notice. There is a $50 fee for using non-biodegradable or non-recyclable products which will be deducted from the Security/Damage Deposit if any are found in the center from your event. We would like to suggest you hire a local to wash your dishes and that you use the Center’s NONdisposable dishware and cutlery. This is the best and greenest solution for the planet and our town. The hall is to be returned to the condition it was originally found in. All tables and chairs should be returned to the appropriate racks and into the appropriate storage area. All ladders must be returned upright in the storage room. Nothing should be left on the floors or walls at the end of an event. The regular floor crew will mop only. Do not use commercial cleaners of any kind on the wooden floor of the main hall. The piano may never be left on a floor heating vent!! A $150 fee will be taken from the security/damage deposit if the piano is found on a vent at any time during or after your event. The Community Center has recycle facilities for cardboard, bottles and cans. We ask that no plastic bottles of water or juice, etc. be served at events. Composting facilities are also available. Our garbage disposal facilities are very limited due to our Village Clean-Up and Beach Clean-Up programs. You will be required to take any trash your event generates home with you. There might be room at our Village & Beach dumpsters to remove trash for $50 fee, ask if necessary. The organizer of the event is responsible for locking up and turning off the lights and thermostat before leaving. Failure to secure the building after any event may result in forfeiture of the security/damage deposit. It is mandatory that the building and the surrounding grounds be left free of trash, cans and bottles at the end of the dance. The cleaning/damage deposit is $150.00 and it is not intended to be forfeited to avoid cleaning up the building. Bands must clear the building within one hour after the end of their performance. We ask that all guests and performers keep their voices low when leaving the building late at night; we have many neighbors on all sides of the building. MUSIC MUST END BY 12:30 A.M. Building must be left as it was prior to the event. For dances having a significant number of teenagers: No alcohol in any form is to be allowed in the building. Two or more chaperones/bouncers are to be supplied by the band/organizers; these individuals shall be responsible for keeping alcohol out of the building. A monitor for the Center’s Board will (may) check out compliance with the No-Alcohol rule. If the rule is not being followed, the monitor will ask the band to stop playing and clear the hall of alcohol. It is the promoters’ responsibility, not the monitor’s, to ensure compliance with the request. The band may begin playing again only when the hall is cleared of alcohol. Performance groups must have their performance date booked with the Center Manager eight weeks in advance of performance. Booking requests with less notice may be allowed on a case by case basis. Performance groups can take precedence over classes (for rehearsal purposes) for one week prior to the performance, provided four-week notice has been given to the Manager. If more time than one week is needed, they must have the approval of the Rental Policy Committee. Kitchen must be left as found. All dishes must be washed, dried and put back in their places. Propane must be turned off after use of the stove. Food must not be left in the kitchen (fridges) after the event. All countertops must be wiped and food scraps picked up off of the floor. Compost, garbage and recycling removed. There is a separate Kitchen Rental Contract that needs to be signed by any Caterer using the kitchen facilities which includes a separate $100 deposit and confirmation of a $12/hour payment. Do not use duct tape for anything in the Hall, including walls, floor or stage. Do not nail or drill into the walls: $75 fee! Do not touch, unclip or hang anything off the Aerial Art equipment hanging in the Hall. The manager is responsible for enforcing policy. Decisions may be appealed directly to the Community Center Board of Directors at their monthly meeting. Be ready to provide names and contact numbers of security staff for your event. All big music performances and events with alcohol on the premises need security.